Home > writing > It's 2011 NaNoWriMo Time! While still nursing the sugar hangovers of Halloween, a few brave writers embark on a crazy and inspiring journey with one goal in mind: 50,000 words in a single month. NanoWriMo encourages participants to join in on the 'thirty days and nights of literary abandon'. It requires some serious dedication, but plenty of writers have emerged with a solid and workable first draft. If you've got the guts to give it a go and are throwing your pen into the ring this year, stop by and check out a few sites with some tips to get the most out of your NaNo experience. Absolute Write Forums Everyone can use some support! Stop by and share your woes, offer support to others, and cheer each other on. Check out Galley Cat's Thirty Tips For Thirty Days. Are you NaNoing this November? How confident are you feeling? *raises hand* NaNoWriMo and me? We go way back. Okay, not really that long - only three years (including this). Nevertheless, it sure is a crazy, thrilling ride. What I love about NaNo is the zeitgeist. Everyone around you has suddenly buckled down and vowed to do an impossible thing. Many people fail, but it's the fierce dedication to doing something great, that brings the month alive. I feel like I can catch the wave of that motivation and use it to get things done, whether it's 50,000 words, or a research paper. This year, it's revisions of my WIP! As I've been about 13,000 words into my 3rd draft of a 70,000 word piece since August, it seems insurmountable, but insurmountable tasks are what NaNo is for! My first go at NaNo. So far the word count is going slowly just because I started a new job on Monday. Supporting children in class has been exhausting so haven't had all my energy to writes tons each night. I'm determined though. :) It's actually given me some confidence and I think I'll reach the target. NaNO and I go way back. I've been doing it for six years now. I love love love it. Definitely an experience worth having. 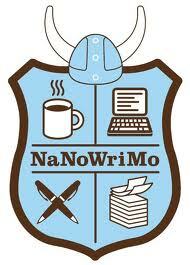 This is my first year participating in NaNoWriMo. Although I am a nervous nitty working with a short synopsis, shorter character bios and twenty million things running around my head, I'd have to say that I'm glad to have a hint of confidence at all. i do nano every year...i hate writing first drafts, and nano's a great way to get something down on the page so i can get to the fun part of writing: revising the hell out of every word.